A heavy couple weeks of news and announcements, followed by a quick look at the new models coming for the Ten Thunders. -OMG Gosh it's Book 5! We got a peek at the cover, as well as a description of what's coming inside, namely new upgrades for all the old masters! Hmm, where did I hear that one mentioned before... Ok, so before I get in trouble, let me reiterate that when I wrote that post, I WAS NOT on the playtesting team for Book 5 yet, and I did not, in fact, know anything. There's a reason I haven't mentioned the theory again since. Anyways, we saw a quick preview of a couple of the new upgrades that are coming, one for Lady Justice that gives her more of a hit-and-run style of play, and one for Seamus that takes his already impressive ability to manipulate Terrifying checks and turns it up a notch. More on these when there are more available to discuss. 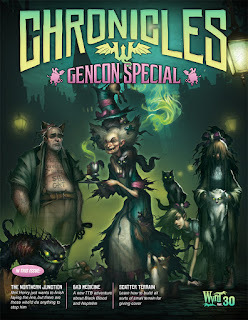 -A new issue of Wyrd Chronicles came out as well, discussing some of the design process for Book 5 and what's coming. Also, there's a Through the Breach adventure published in there by one of my favorite authors, wherein you take a fellow he's afflicted with Black Blood to go get a cure, only to discover that the cost of this cure may be quite high. 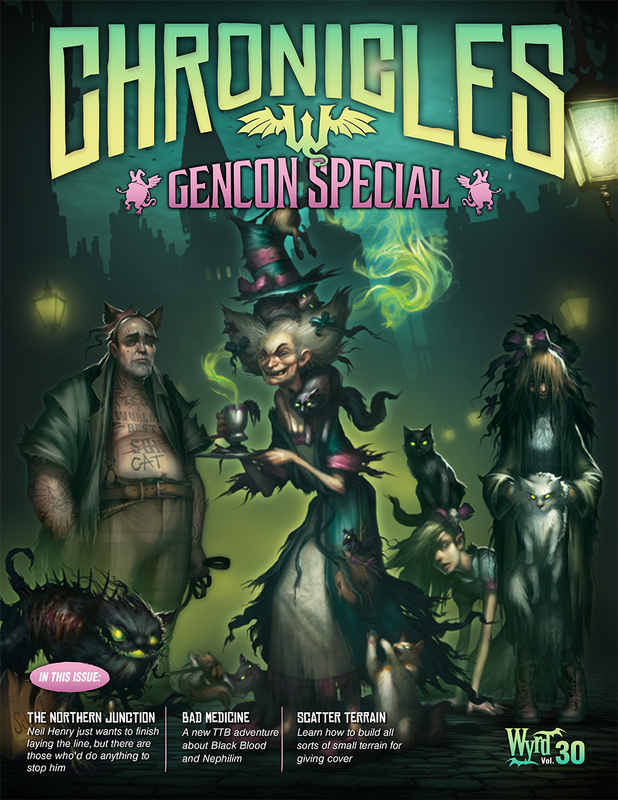 -The cover of said Wyrd Chronicles features this year's Gencon Nightmare Edition box, which has been shown to be an alternate Hamelin crew styled like a Crazy Cat Lady. Not my cup of tea (I don't play Hamelin) but it's a funny idea all the same. 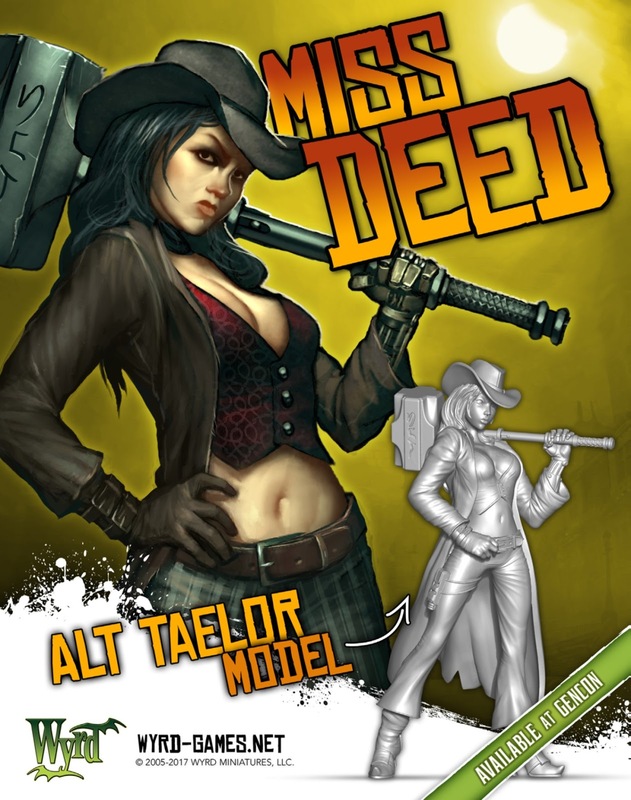 -Additionally, the issue of Wyrd Chronicles mentioned that this year's Miss Model is an alternate Taelor named Miss Deed, who looks like she'd look right at home in any Western themed crew. Additionally, an alternate Sybil was shown as well. 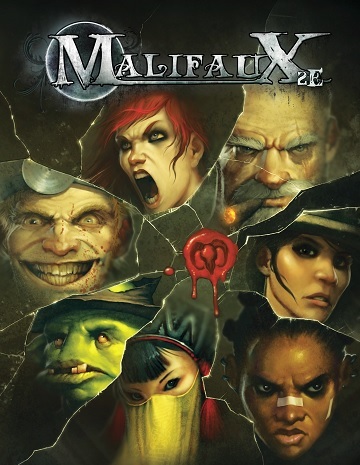 You earn this one by spending $60 on Malifaux products during August (like, oh, I don't know, Gencon stuff or instance.) You fill out a form on Wyrd's website, send them a picture of the receipt, and you get the model. Couldn't be simpler! -Are we done with Chronicles yet? NO! There's also a competition going on with the Gencon sales! Any time you buy something at Gencon or online during the convention, you get to vote for whether Nicodem or Lady Justice wins a duel of fate! What could be the consequences of this? Who knows! -The art previews have continued to come, this time for the Cyclops from Neverborn in Monday Previews and two more commanders from The Other Side. I don't want to link them all, you can find them easily enough. Gwyneth Maddox-8ss Henchman-A henchman Lynch has to pay for? Hard Pass! But seriously, she’s interesting. Seems to be an upgraded Beckoner with some interesting card manipulation abilities. Luck thief makes enemy + flips count as – flips against her and allows her to heal when models miss attacks against her, which should provide some interesting defenses. At the beginning of its activation it can stack the top 3 cards of the fate deck or throw them away, so some more card manipulation for the Ten Thunders, particularly when paired with her (0) Hit Me to draw some of those cards into your hand. And The After Party lets you get away with not bringing the Addict upgrade by just building it in to her from the start. Her gun is ok, with a built in trigger to spread more Brilliance which the Lynch crew has probably needed. And finally, her 1 AP Come Play At My Table works a bit like Bert Jebsen’s Cracker Jack Timing as a way to pull models into base to base with her, and can also hand out some more Brilliance with a trigger. Very interesting model. Katanaka Crime Boss-8ss Enforcer-Finally, the alluded to mafia side of the Ten Thunders is getting some representation in the game. These guys seem like they’re designed to hold points in the game, as the front of their card is designed to resist shifting them from a particular spot and punish enemy models for dropping scheme markers near them. This is paired with a decently damaging melee attack on the back and a nasty one-two punch with the A Lesson You Won’t Soon Forget that boosts the Nagamaki’s mediocre Ml value to 5 and grants a + to the damage flip. It can heal with a 0 action with the familiar Calls Unto the Chi tactical action and can give itself an ability until the end of the turn to draw a card whenever an enemy model activates inside the Crime Boss’s engagement range. Interesting not just for the abilities, but because the Thunders don’t have a ton of “Hold this Point” type models. Lotus Eater-6ss minion-Another defense oriented model, the LE has the same protection money ability as the Crime Boss and Bully, which makes an opponent discard a card to walk or interact within 3” of them. The Lotuses that the minion eats are scheme markers, and it can chew on one at the beginning of its activation to either heal 2 damage or take a 0 action (even if it has already declared one this turn). One of the model’s 0 actions lets it move and eat another scheme marker, potentially allowing for a chain of movement and making it pretty good at defending against Claim Jump. It has a middling melee attack that uses CA and heals the LE, or it can place a condition on an enemy model forcing it to discard two cards to be able to declare actions on its turn, which can be enhanced with the Aggressive Stance to force weaker WP models near the LE to take a – to all duels involving the LE. Could be useful as a denial piece. Obsidian Statue-9ss Enforcer-A heavy beater for the faction, this model combines some defensive abilities with a relatively hard hitting melee attack. At the end of its activation, it drops a ht3 50mm marker in base to base with itself to create some mobile cover. It has armor, can’t be pushed, placed, or buried while the statue marker is on the board, and drops scrap markers every time it gets hit which can then be used to heal itself. The model is designed to set things on fire with its Spew Lava attack to give it burning and then land a melee attack with its obsidian fist, gaining a + to the damage flip if they have burning. It’s always tough to tell which beaters will end up being most effective when so many are already in the game. It isn’t very fast and the Df of 3 leaves something to be desired, but it could do some damage in a crew that can overcome these issues. Charm Warder-5ss Minion-Another defense oriented model, this one punishes enemy summoning crews. Any model summoned near them gains the Entropy condition, which deals damage to equal to the condition when the model activates and can then be reduced at the end of the model’s activation, at the cost of discarding cards (which most summoning crews can’t afford to do.) They also block scheme marker placement near them, and can offer some protection to friendly models near them that have activated, granting them a + to Df and WP duels and by using its Charm of Vanishing (0) action to make attacks against the model have the chance to fail. They can also hand out Disguised, deal a little damage in melee (not the reason you would take a warder, but still handy to be able to switch between Ml or Ca for the attack and Df or WP for defense), and can add on Entropy with an attack. Tanuki-5ss Minion-This model is an odd one, as tends to be the case with Tri-Chi. Any model that activates within 8 of it and in base to base with a scheme marker gets a point of poison, which can end up being slightly easier to set up than it sounds with its built in defense trigger to place a marker every time they succeed on a defense check and get a little extra movement or with its Gourd Bop attack, which also drops a scheme marker. It can force models to reduce their poison condition by half and take all that damage at once, which is potentially useful (or painful for a McMourning crew.) Alternatively, friendly models can reduce their poison condition by up to 4 and heal a point for each. If done to aTri-Chi for 3 or more wounds, it hands out Reactivate to minions or enforcers or Fast to Henchman or Masters. Finally, when they activate they can chose to immediately end their activation, drop a scheme marker, and then count as two models for the purpose of the strategy. So, they could be good as scheme runners, presumably, though Wk 5 and no mobility tricks other than the defense trigger don’t naturally suggest that. I’ll not pretend to be an expert on the Brewmaster, but this doesn’t immediately jump out to me as being amazing.